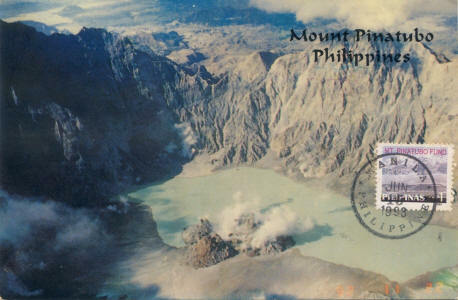 Mount Pinatubo is an ACTIVE stratovolcano which last erupted in 1991. 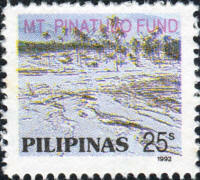 Mount Pinatubo is located on the island of Luzon and is permanently monitored. 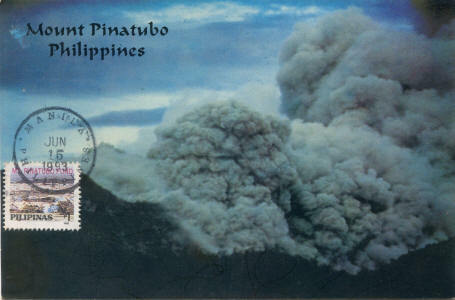 The volcano's ultra-Plinian eruption in June 1991 produced the second largest terrestrial eruption of the 20th century. Before 1991, the mountain was inconspicuous and heavily eroded. It was covered in dense forest which supported a population of several thousand indigenous people. The 1991 eruption came some 450-500 years after the volcano's last known eruptive activity. Successful predictions led to the evacuation of tens of thousands of people from the surrounding areas, saving many lives, but surrounding areas were severely damaged by pyroclastic flows, ash deposits, and later by lahars caused by rainwater remobilizing earlier volcanic deposits: thousands of houses and other buildings were destroyed. 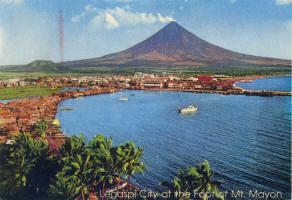 The effects of the eruption were felt worldwide and global temperatures dropped by about 0.5 °C. 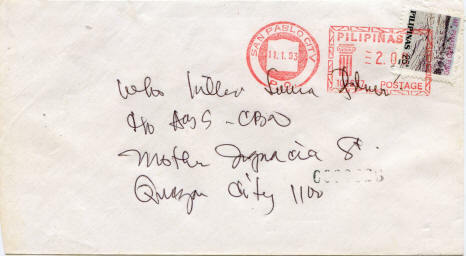 The stamps were printed in sheets of 200 on watermarked paper (Bureau of Post Seal). 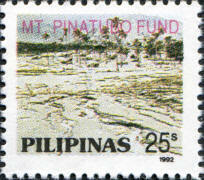 60,200,000 of the 25sentimos and 30,000,000 of the 1peso stamps were printed. 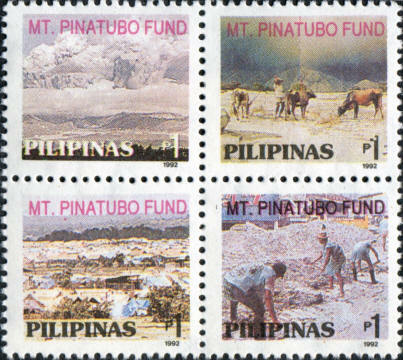 The stamps depict lahar flows and the erupting volcano and the aftermath of the eruption with animals foraging for food, an evacuation camp and excavation of the ash. 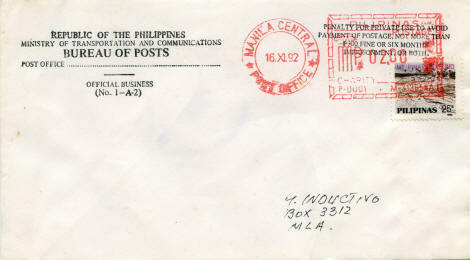 A proclomation in November 1992 placed a surcharge on all types of mail to operate between 16 November and 28 February 1993, a period of 105 days; 25c for domestic mail and 1peso for international items. Although obligatory taxes had been applied previously in the Philippines, the additional domestic cost was not well received and a Manila businessman took the Government to the High Court who decided the surcharge was unconstitutional. 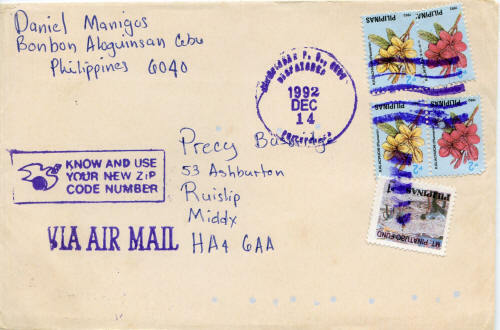 Therefore the stamps were withdrawn for sale on 1 February 1993 (only 78 days). 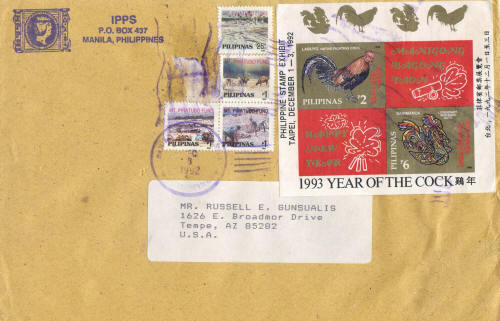 The above stamps were therefore required for all mail as a postal tax stamps between 16 Nov 1992 and 1 Feb 1993. 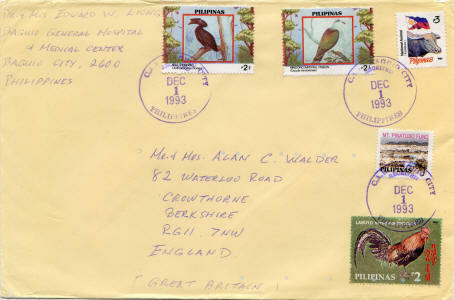 The stamps were re-issued and became valid for postage in their own right on 14 Jun 1993. 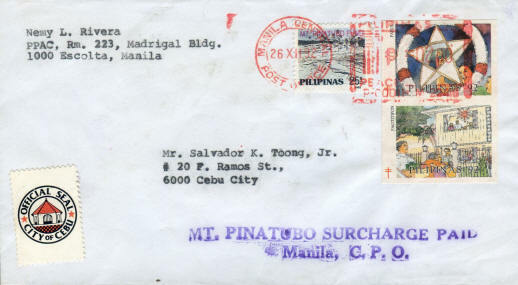 The above stamp shows Lake Pinatubo the summit crater lake of Mount Pinatubo which formed after the eruption in 1991 which destroyed the volcano's original summit and left in its place is a 2.5km diameter caldera. 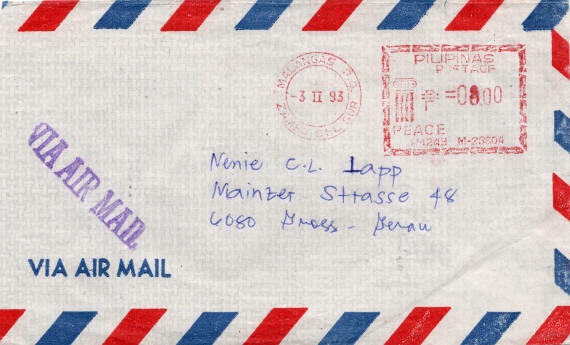 Type 1: As the tax was required to be paid at all post offices, if the post office had not yet received stamps then it has been suggested that a handstamp was applied to indicate that the surchage had been paid. 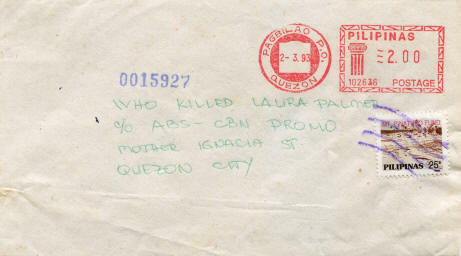 One such domestic cover is known orginating from 9100 Mambajao, Camiguin. 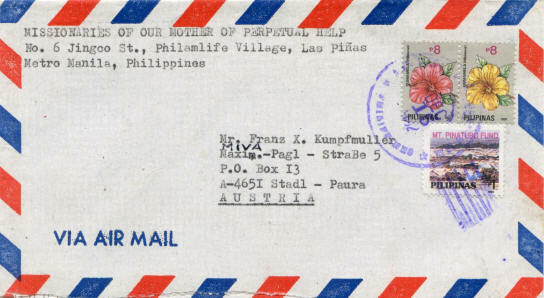 Type 2: This handstamp appears to have been used in different manners. 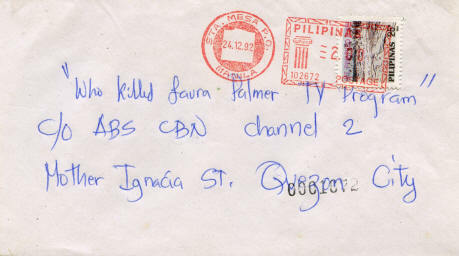 A cover is known on a meter franking of 8c from Makati C.P.O to Australia. 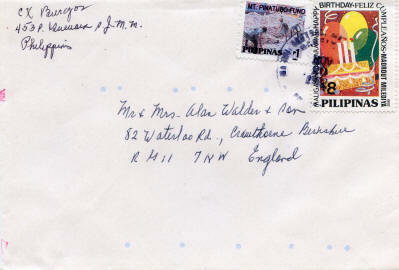 In this example the handstamp appears to have been applied in lieu of the postal tax stamp. 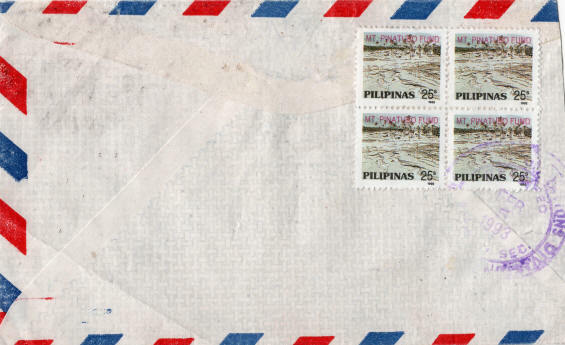 The post office in the San Juan district of Metro Manila appear to have empoyed the handstamp to cancel the postal tax stamps. 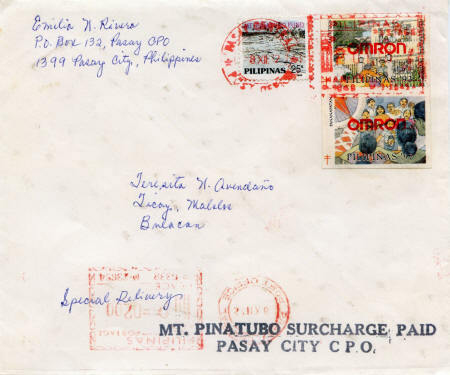 The post offices of the other districts of Metro Manila appear to have applied the handstamp such that it avoided canelling the stamps. 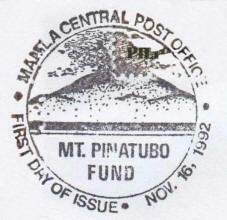 Mt Pinatubo Postal Tax Stamp on cover from San Juan to North Canterbury, New Zealand. 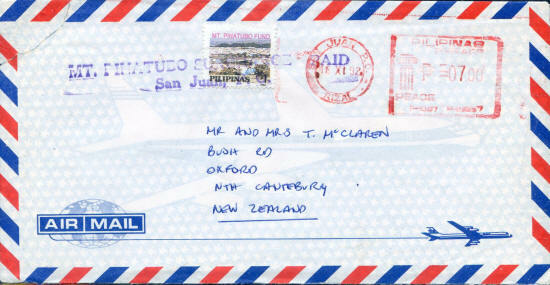 1p postal tax stamp applied in addition to the P7 air mail rate to New Zealand, - 18 Nov 1992. With Type 2 "MT. PINATUBO SURCHARGE PAID / San Juan P.O." 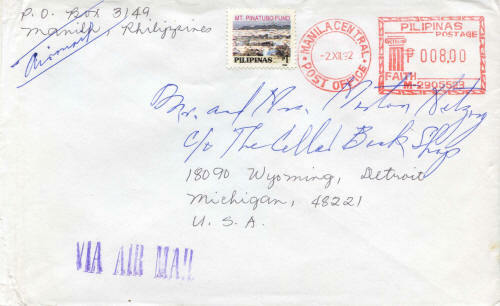 handstamp as an obliterate to the postal tax stamp. With Type 2 "MT. 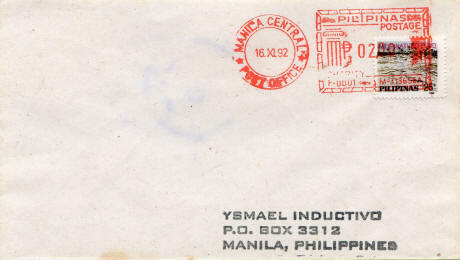 PINATUBO SURCHARGE PAID / Manila C.P.O." handstamp. 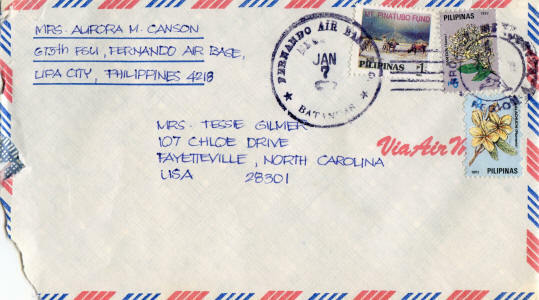 Type 3: A third handstamp in a different font without the originating post office included is known. 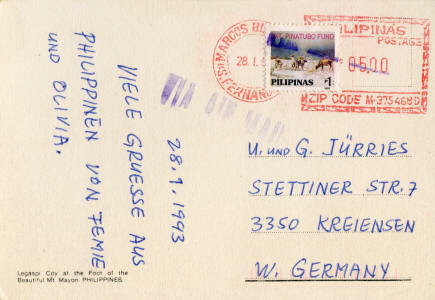 A cover is known on a single air mail rate of 8c from an Aklan address (the post office canel is unclear) to France. 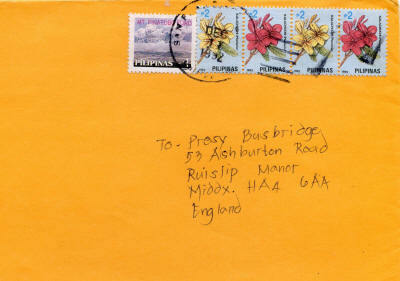 The handstamp is applied such that it avoided cancelling the stamps. 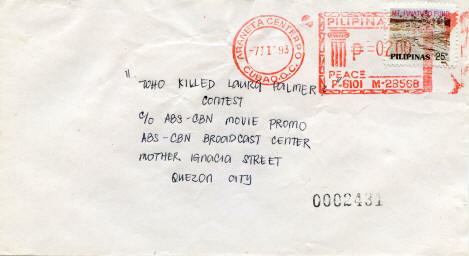 Mt Pinatubo Postal Tax Stamp on commercial BANKARD INC commercial window envelope, from Makati Central Post office. 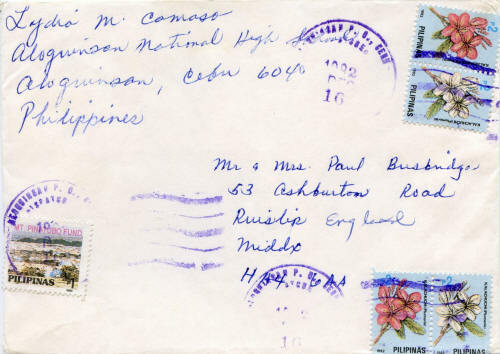 Metered cancel of 8p suggests international destination; however, only the 25c postal tax stamp applied (for domestic use) - 25 Nov 1992. 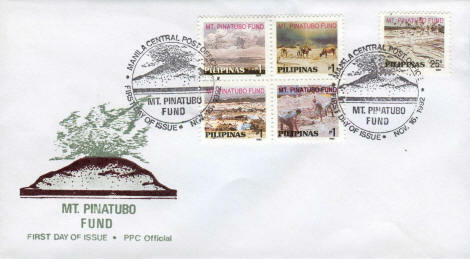 Additonal slogan "For the country... For the people..."
Mt Pinatubo Postal Tax Stamp on VE del Rosario & Partners commercial cover form Makati to New Jersey. VE del Rosario & Partners is a law firm which started in 1949 (at that time as VE del Rosario & Associates) offering services to American companies interested in operating in the Philippines. The company is now known as Vera Law. JC Domingo Enterprises Corporation are a food processing and packaging company based in the Philippines since 1954 and are primarily involved with the provision of tinplate cans. Federal Phoenix Assurance Company, Inc. provides insurance products in the Philippines. It offers motor, fire, casualty, engineering, marine, personal accident, and medical insurance products, as well as assistance and claims services. The company was founded in 1958. 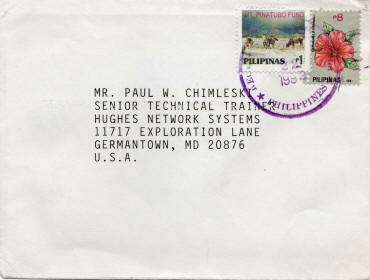 The company operates today as a subsidiary of Zuellig Group. 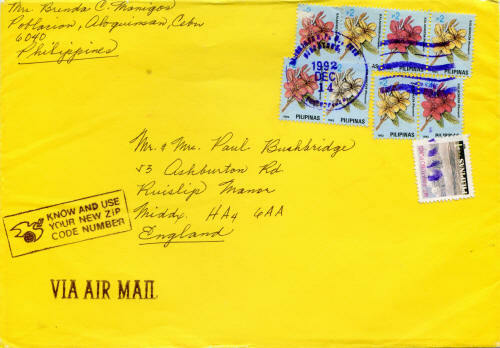 The stamps were not very popular when used as regular postage since single stamps exsited to cover the standard domestic and international postage rates. A used block of twelve 25c stamps to make 3p.